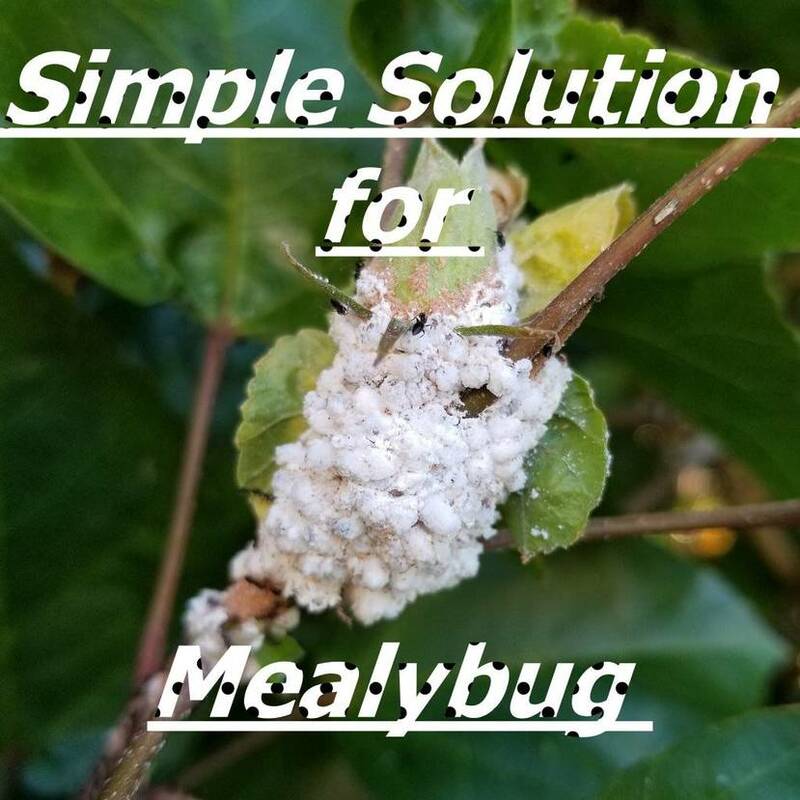 Simple Solution for Mealybug/ White insects. Hey guys, very recently I did a survey I asked you, people if you have ever had a Millybug problem. Are these white bugs that you see on the plants. Interestingly about 80% people on Instagram said that yes. They have had a Mealybug problem, and they would really like a solution. So today I'm going to talk all about it here. I have a hibiscus plant which has festered by Mealybugs. Actually, this problem is also common in the most serious pests are mealybugs that feed on citrus; other species damage sugarcane, grapes, tomato, pineapple, coffee trees, cassava, ferns, cacti, gardenias, papaya, mulberry, sunflower, and orchids. Okay so before I jump onto the solution of what, you're supposed to do I would really like you to understand. Why these Mealybugs appear on your plant and what is the basic science. behind them, it just makes it easier to understand and to control such problems you know. You can always apply a chemical and deal with them but it is always better to have a little more understanding of the plant since. You were a gardener or you like to keep plants to know you know what is really going around. So I'll try and explain very quickly, see these Mealybugs are they soft-bodied insects. now if you have Mealybugs in your garden. I'm sure you have also seen ants in your garden. And a lot of people complain that you know, I haven't I have treated them with so many chemicals and nothing is happening interestingly. These ants and these Mealybugs have a very good relationship it's like bhaiChara. They have a mutualistic relationship. What happens these aphids they feed on the stem and leaves of the plant and get sugar substance basically the plant food out of the plant. So now these Mealybugs will offer this sugar food to the ants and the ants in return will give them protection. So they have this you know mutual understanding, as a result, it's very difficult to get rid of these Mealybugs. Because the ions will make sure that you know no other insect comes and feeds on them and these Mealybugs. you could also use sprays that come for barber shops, you can attach them on a plastic bottle and they're good enough to use the concentration of the shampoo in this water. Could also depend on how intense the problem of infection is. I use about 3/4 ml in 1 liter of water we will just cover this up shake it properly and pump in the air. Now you just spray this over your plant spray it nicely spread under the leaves on the leaves on the stem within 2 3 hours. 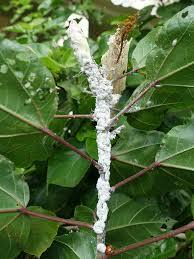 You would notice that these mealybugs start dying and also the number of ants would reduce heavily. Now a tip for using the solution does this in the evening or at night the. The reason is that most of the plant activity that is making its food or evaporation and everything is happening mostly. In the daytime and the Sun is also intense so if you cover it with this you know shampoo solution all over it will disturb the plants. Daily activities and also might kill it so don't do this in the morning. Do it in the evening and what you have to do the other day is before the Sun is up like before 12 o'clock noon, use plain water to wash off all of the solutions from your plant. So by the time the Sun will be up your plant will be healthy and once you are done with this spraying you can just check the leaves properly both underneath. And on the stem, you would see that the Mealybug has reduced a lot on the plant okay. Even if this once treatment does not reduce the number of Mealybugs, you can do this again and within a week of time. I know a lot of you might be wondering that hey you know, we were all in for organic farming and why are you using chemicals to do everything completely organic. You can use an organic shampoo there are edible shampoos there are shampoos. That do not have chemicals any harsh chemicals. You can use the exact same method with those organic shampoos as well for me I think this shampoo is fine. Because I'm using it in a very less amount and I'm not really you know putting it as water to the plant it's just sprayed on the leaves and then washed away some of it while. You wash it also goes into the soil but it's the very small amount, I don't think it will have a major impact on the plant.